Decking in some form is a very common feature in many people’s gardens these days and for good reason! Decking isn’t only a stylish decorative piece it can also be used as a versatile and functional outdoor space. But since it is exposed to the elements and nature you are soon going to see the need for deck cleaner. How to clean decking is a question you’ll be asking yourself pretty soon and an important part of having a deck is knowing how to care for it. Because decking comes in many different forms you might think cleaning it will be difficult especially if it is an anti-slip deck. But it is much more simple than you might think and there are in fact a couple of different ways you can do it. Let’s look at all the ways you can get your deck clean in more detail. A deck wash with a power or pressure washer is a quick and effective way to get your anti-slip decking clean. If you don’t have a power/ pressure washer you could use a hose pipe with a power wash attachments instead. Power/ pressure washing can be an effective deck cleaner due to its speed and ease of use. However, there are some potential downsides to using this method of deck wash. Power/ pressure washers can damage wood so make sure it is set to a low power and you don’t overdo it. 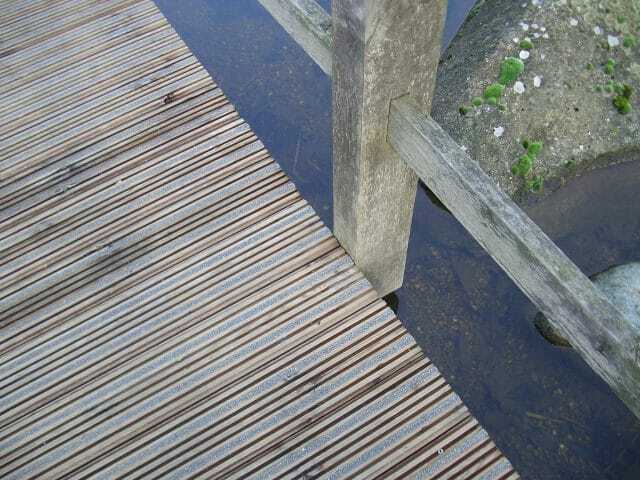 If your non-slip decking is composite decking then it will be more resilient than non-slip wooden decking but you should still be careful when using a power/ pressure washer. You don’t need to use a power/ pressure washer to clean your decking though there is a more low-tech method. All you need is a deck scrub brush and a bucket of water, this method is simple but will take a bit of elbow grease. If you only have a small deck then it might be quite simple but larger decks could take a long time to get clean just using a deck scrub brush and water. You can also use special deck cleaning solutions as well to help with more stubborn stains. Just make sure you are using the right deck cleaning solution for your type of decking. Cleaning solutions are available for all kinds of decking there is wood deck cleaner and composite deck cleaner and both can be quite useful especially when cleaning by hand. So, that is the two main methods of cleaning your outdoor decking but let’s look at some other areas worth considering. Deck Cleaning Solution – Do I Need It? I already talked briefly about deck cleaning solution but is it essential? Deck cleaning solution as you know comes in many different forms but do you really need it or is it just a luxury extra? Well, it really depends on the condition of the deck. If the decking is especially dirty then just using water won’t get you very far. Some people make their own DIY deck cleaner usually using a mixture of bleach and hot water. But shop-bought deck cleaner will usually do the job fine certain types can be mixed with water or it can be applied directly to the decking and then washed off. Well, this will all depend on what method you are using but for most people, you will need a deck scrub brush and some deck cleaner as an absolute minimum. Make sure you have a regular sweeping brush as well so you can sweep up the deck to get it ready for cleaning. Is Anti-slip Decking Any Different From Regular Decking? When you get right down to it cleaning an anti-slip deck is not really any different from a regular wooden deck. You can use different deck cleaning solutions if you like but that is really the only difference. So, there is nothing else you really need to know to get your deck nice and clean and ready for the sunny days ahead.